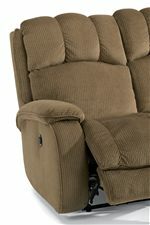 The Huron Casual Power Reclining Loveseat with Plush Padded Headrest and Storage Console by Flexsteel at Conlin's Furniture in the Montana, North Dakota, South Dakota, Minnesota, and Wyoming area. Product availability may vary. Contact us for the most current availability on this product.